Chest Pain — Should You Go to the ER? What will happen if you do? Every year millions of people visit the hospital because of chest pain. While many of these people will have benign problems, a significant number will have significant and potentially life-threatening ones. With heart disease as the biggest killer of adult men and women in north America, chest pain is a symptom that can’t be ignored. The question is how to know the difference between benign and serious chest pain, and whether it is ever safe to stay home with chest pain. The doctor has to consider all of these and more as possibilities in a patient who presents with chest pain. In order to determine which is the most likely, we find out the exact nature of the pain, associated factors, and risk factors one has. For example, “typical” heart attack chest pain is described as squeezing in nature behind the sternum (breast bone), worse with physical exertion, and association with shortness of breath, nausea, lightheadedness and sweating. Risk factors for heart attack include smoking, family history, high blood pressure, high cholesterol, and diabetes. So if a 65 year old man who smokes and is diabetic comes in with squeezing chest pain we naturally need to check out his heart. Risk factors help guide us toward other diagnoses as well. Risk factors for aortic dissection include high blood pressure, increased age, male gender, and some connective tissue disorders. Risk factors for heartburn or acid reflux include smoking, alcohol consumption, caffeine consumption, pregnancy, and diabetes. Risk factors for blood clots in the lungs include immobility, long-distance travel, and pregnancy. Risk factors for pneumothorax include being tall and thin, asthma, and some connective tissue disorders. Risk factors for stomach problems such as gastritis (inflammation of the stomach) include regular consumption of antiinflammatory medications and of alcohol. Things that promote acid reflux include large meals, fatty foods, alcohol, particularly red wine, black pepper, garlic, raw onions, spicy foods, chocolate, citrus fruits, coffee and caffeinated drinks, including tea and soda, peppermint, and tomatoes. Once the doctor has spoken with you he or she will examine you, looking for any telltale signs of the cause of your chest pain. An EKG (heart tracing) will be done. And further testing will be done, such as blood tests, a chest x-ray, or an ultrasound or scan. It is worth noting that heart attack-related chest pain is frequently atypical, especially in diabetics, who may not feel pain but may feel shortness of breath, and in women, who may feel more of a hot or burning sensation in their chest or may feel the discomfort in their backs. Some believe erroneously that heart disease effects women less than men, but it is a leading cause of death in women. This belief can be deadly as women may delay going to the doctor, thinking it is not a heart attack. Which brings us to the original question — when is it safe to stay home with chest pain? The answer is that no one can ever tell you it is safe to stay home with persistent chest pain. Certainly there are more worrisome types of chest pain and people who are at greater risk of serious causes of chest pain. But without speaking with you and examining you no medical professional can guarantee that your chest pain is benign. So if you have persistent chest pain, or shortness of breath, get to an ER. But don’t drive yourself. 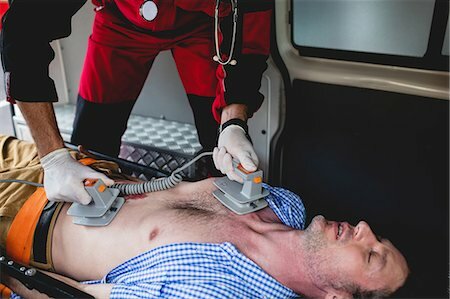 The best way to get there if someone is having dangerous chest pain is by ambulance, where paramedics can potentially begin life-saving treatment en-route to hospital. It’s like the cardiologists say, “time is (heart) muscle.” If you go to the hospital and are fine all you have lost is some time, if you don’t go and are having a heart attack, you could lose your life. Next: Perspective — Health and Loved Ones are What’s Important. These Kids Get It.